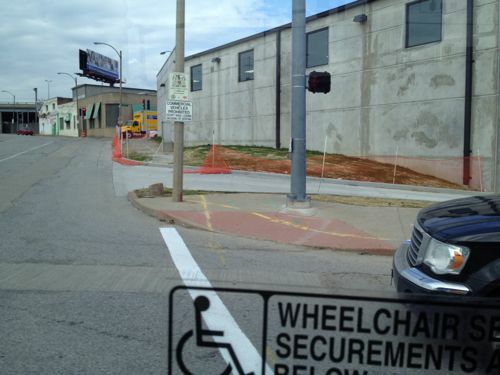 In March I blogged about an ADA issue I spotted from a MetroBus (see: New Driveway Makes Sidewalk Non-ADA Compliant (Updated)). 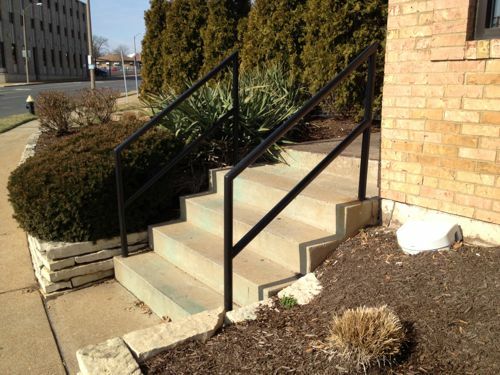 Curbs for the driveway prevented passage in a wheelchair. ABOVE: New driveway to Park bisects the public sidewalk without ADA ramps. March 2012. This will get fixed as part of a project titled 8496 BROADWAY & 7TH STREET IMPROVEMENTS (PARK AVENUE TO I-55 OVERPASS),FEDERAL PROJECT STP-5422(612), ST. LOUIS, MO : that will have a pre-construction conference on March 7th. Still, this shows clear lack of oversight on the part of inspectors to allow something like this to get built in the first place. As the city told me, the began right away. I still haven’t visited since the work is just wrapping up, but I’ve been watching as I pass by on the bus. ABOVE: Extensive work has been done in the 7th/Park/Broadway area, still ongoing in September 2012. Click image to view in Google Maps. Once construction has finished I’ll visit the area and take a critical look at the finished product. 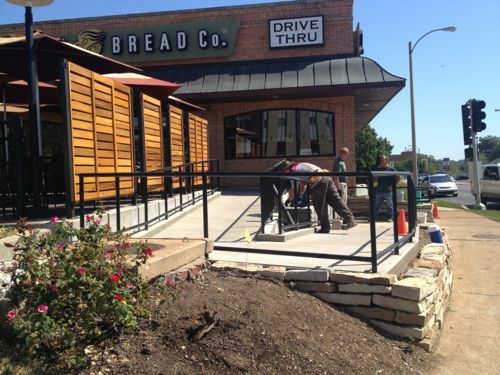 ABOVE: In February 2012 access to the St. Louis Bread Co. at 6607 Chippewa from the public sidewalk required going up steps. I contacted and company and met with District Manager Chris Harre onsite on my birthday, February 28th. 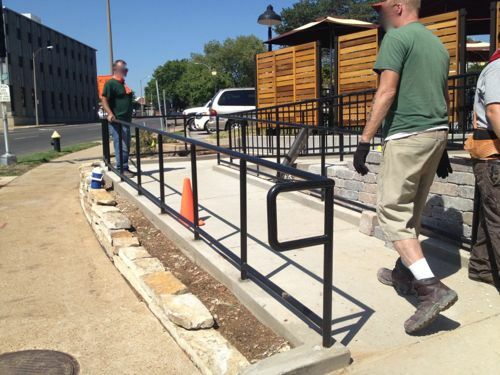 On May 1st a building permit application was filed with the city to build an accessible ramp at an estimated cost of $5,000. When I visited the site late last month workers were still finishing up final details. ABOVE: View from the top of the ramp. The triangular wedge between the upper & lower sections of the ramp will contain plants. ABOVE: The new ramp is highly visible, says all pedestrians welcome here. I appreciate that Panera acted quickly once I pointed out the accessibility problem, if only other companies would do the same. Special thanks to District Manager Chris Harre. Every city probably has a Broadway; I grew up on Broadway Ave in Oklahoma City, I’ve been to Broadway in NYC and I’ve seen traveled all of Broadway in St. Louis. 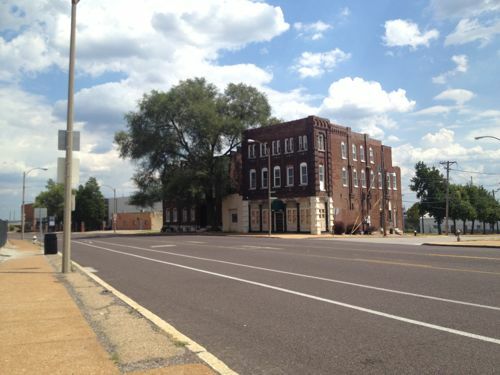 Correct me if I’m wrong, but Broadway is the only road in the City of St. Louis that crosses the city limits in opposite ends, north and south. 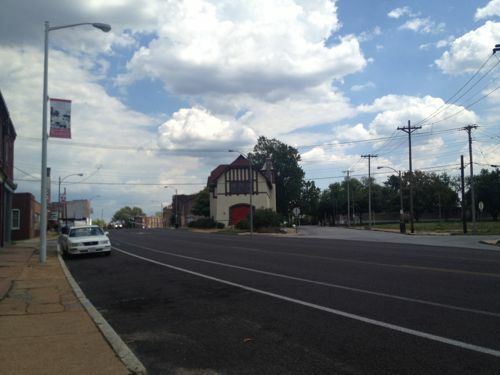 Broadway in St. Louis varies in feel as it curves along following bends in the Mississippi River. To my eye one the mile stretch through the Marine Villa neighborhood is the most interesting. 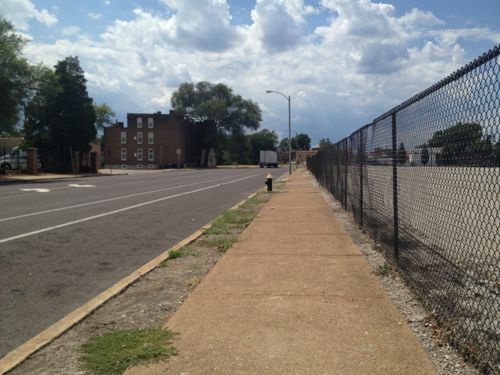 I’d driven, scootered and bicycled this mile stretch of Broadway from Keokuk St. on the south to Cherokee St on the north numerous times in my 22 years in St. Louis but recently I “walked” both sides using my power wheelchair. 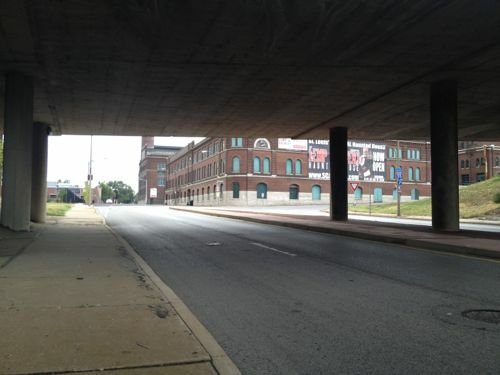 Naturally my mind started thinking of ways to revitalize this corridor so this post is a look at the good, the bad, and some of what’s needed. I’ll share some of the 250+ pictures I took on Sunday August 19, 2012. ABOVE: Broadway heads off to the right just past Keokuk. 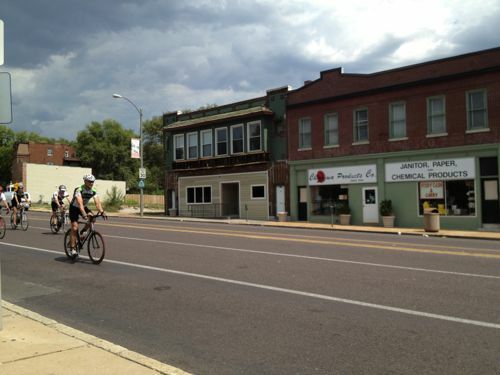 The intersection of Broadway, Jefferson & Chippewa has been a commercial center since the 19th century. 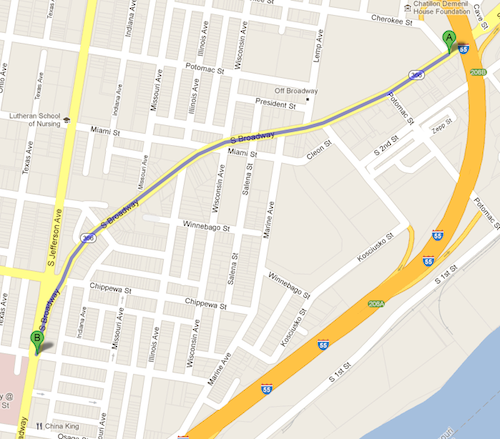 ABOVE: Map of the mile stretch of Broadway through the Marine Villa neighborhood. Click image to view in Google Maps. ABOVE: Detail of 3812 S. Broadway, built in 1896! ABOVE: In the wedge where Broadway meets Jefferson at Chippewa is a fountain surrounded by overgrown shrubs. Really? 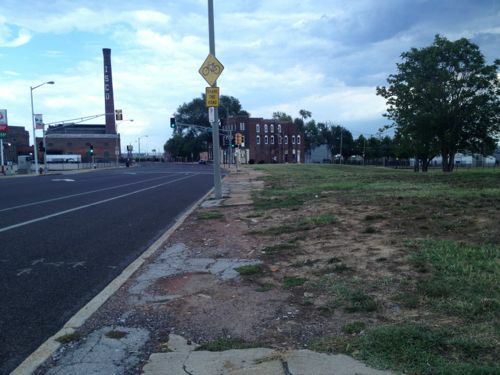 Is this supposed to be positive public space? It looks like it was designed to repel, not attract, people. 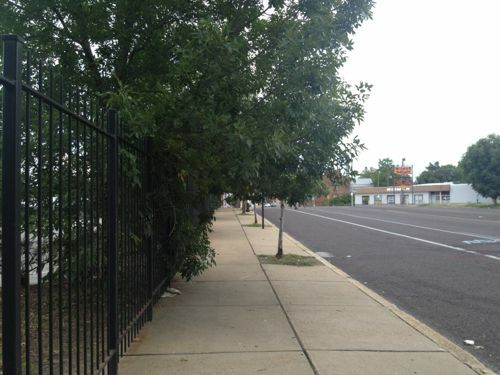 ABOVE: City records show this “park” was built in 1998, after Ald. 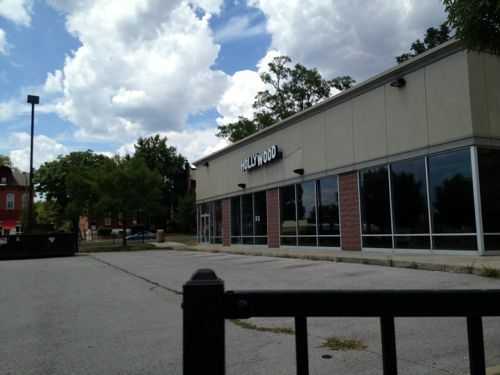 Craig Schmid had the city buy and raze the existing building. 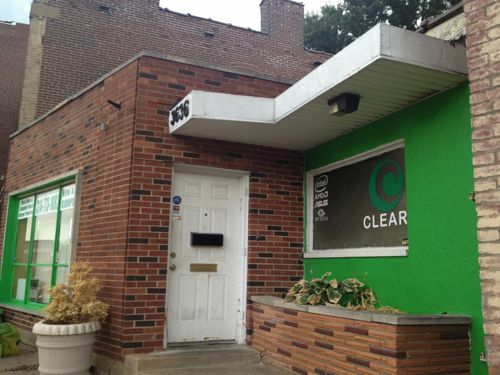 ABOVE: Also in the space between Broadway & Jefferson is a former Hollywood Video store. 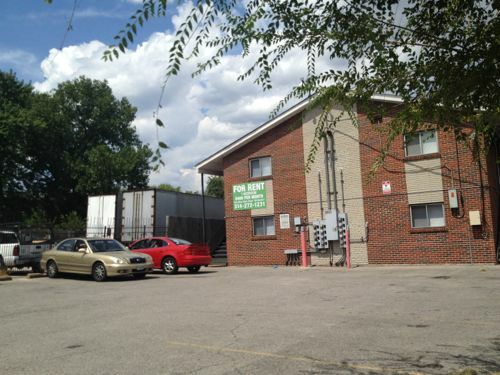 The suburban parking lot, just behind Schmid Park, was never appropriate at this location. 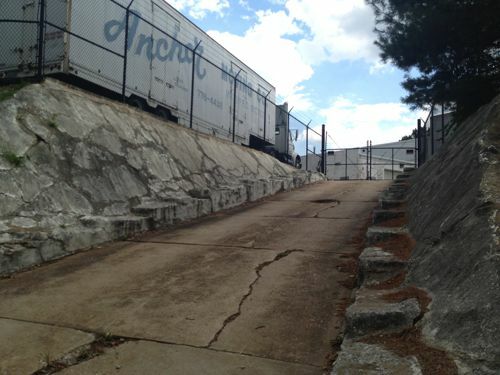 ABOVE: Parking lot for the school creates a long dead zone, needs buildings again. ABOVE: The way the orthogonal street grid intersects with the meandering Broadway creates interesting but awkward intersections. 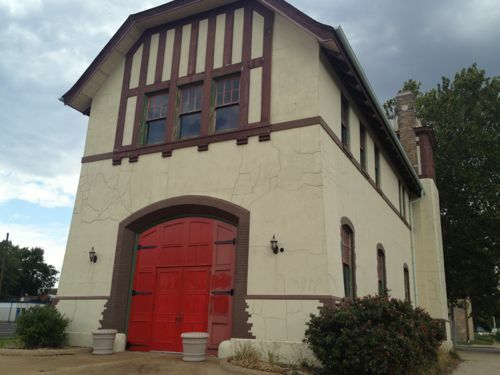 ABOVE: Former fire engine house #3 bounded by Broadway, Miami St & Salina Salena St., owned by the city but leased out to an individual for storage. ABOVE: 3640 S. Broadway has seen better days but the barely visible old cast iron storefront is an obvious clue it was built long before 1941. 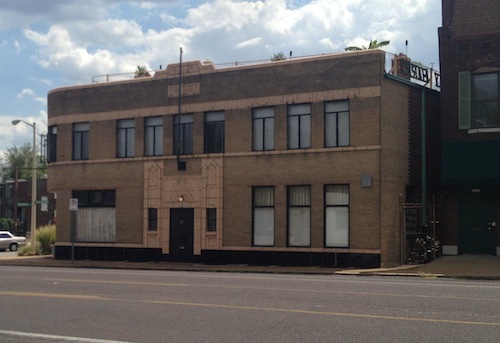 This 6,000+ sq ft doctor’s office & residence was built in 1941. I had the pleasure to tour the building a number of years ago. 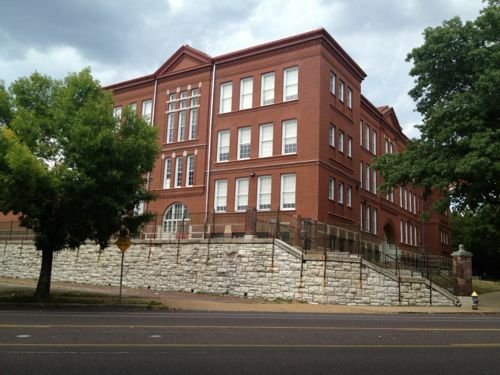 One of my favorite buildings in St. Louis! Just 5-6 years ago an interesting grouping of a few 4-family buildings existed here, I was talked casually with an investor about buying and rehabbing them. 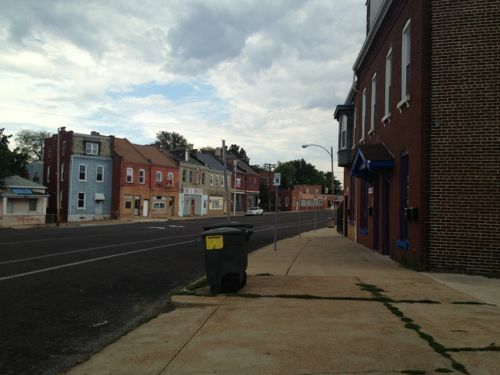 This is where Lemp Ave intersects with Broadway. 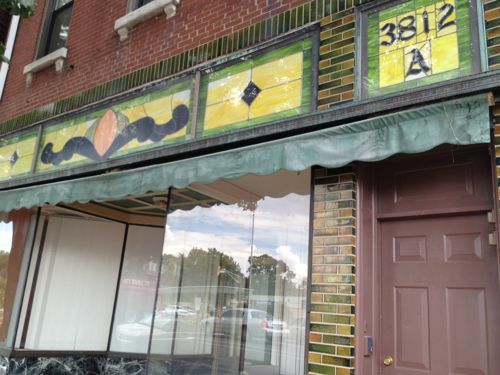 ABOVE: The bar/grill in the ground floor of this 1887 building at President St has closed. We have a President St? ABOVE: The design of the buildings presents many challenges, including accessibility for the disabled. 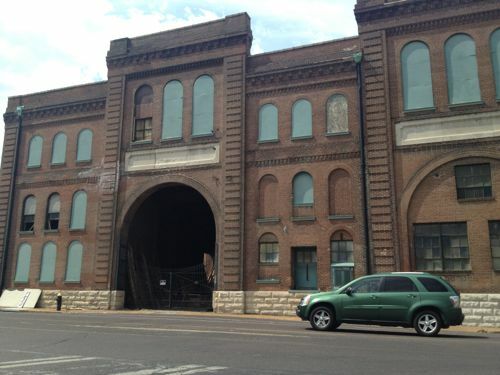 It’s being marketed as the Lemp Brewery Business Park, click image for website. 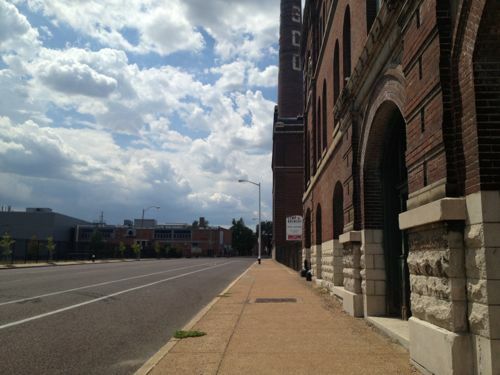 ABOVE: Heading south on Broadway the Lemp Brewery complex is the first thing you see as you go under I-55 at Cherokee St. Undertake a corridor study to take an in-depth look to inform future policy decisions (aka zoning, infill, etc). Issue an RFP to replace the Schmid fountain and vacant Blockbuster Hollywood Video with a 2-3 story mixed-use structure with urban form, unless #1 above says a park at the intersection of three major streets is a good idea. I can’t imagine that being the case. 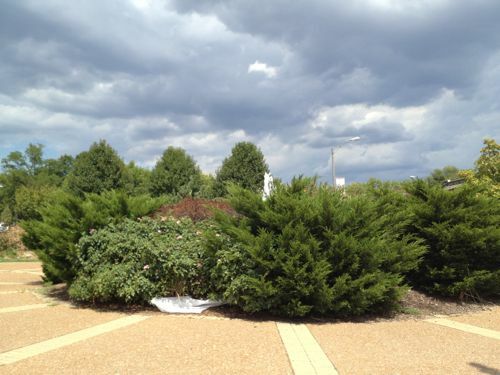 In the meantime remove overgrown plantings around the fountain and islands in the area. Replant with low maintenance plants that don’t get so massive. 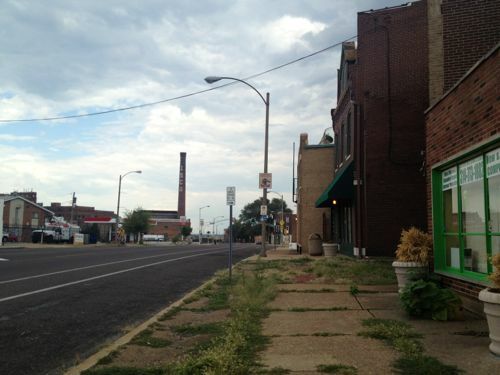 Create a marketing campaign (brand identity) for the commercial area where Broadway, Jefferson & Chippewa meet. Get the name for this area circulated so it becomes recognizable. 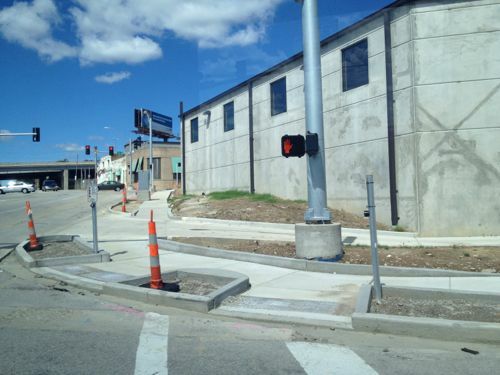 Look at curb bulb outs or other treatments to visually narrow the roadway. Alternatively, this might be a good area to place the bike lane between the on-street parking and curb. Perhaps literally narrowing the road is a good idea, it was likely widened in the early 20th century. 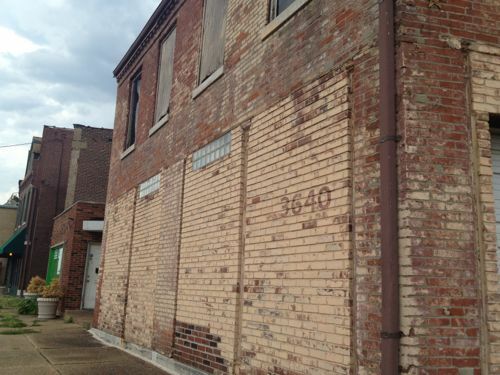 Develop a form-based code to guide infill in vacant areas, in particular Lemp & Broadway. 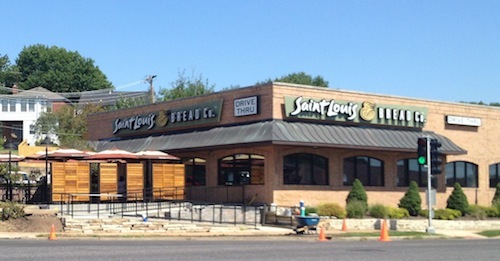 A free-standing McDonald’s with double drive-thru wouldn’t be desirable at that corner. 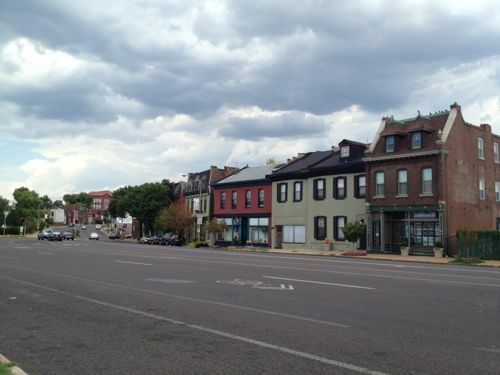 But a CVS in a new multi-strory mixed-use urban building would be a nice addition in my view. 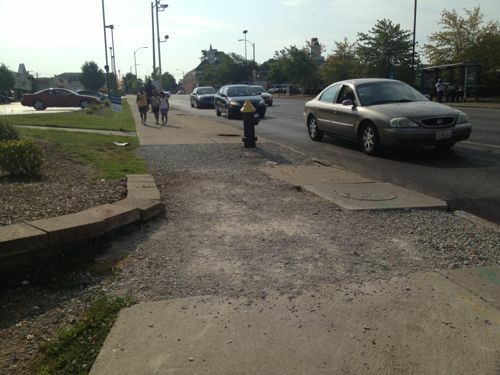 Look at the sidewalks, fix areas where broken or missing. Clean off other areas where grass has grown over the sidewalk in other areas. Organize monthly walks up and down the street. Find a more positive use for the firehouse. 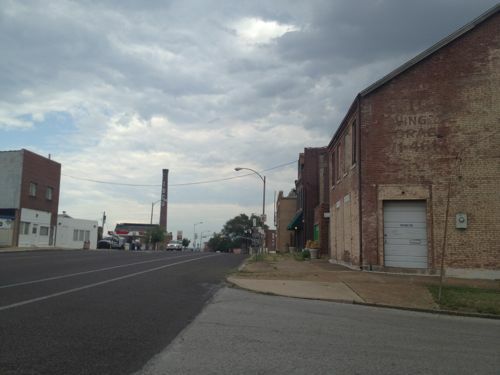 Work with the Brewers & Maltster’s Union hall to the south on developing their vacant land between their hall and the firehouse. I’m sure I’ll have many more thoughts the more I think about it. What are your thoughts? Generally negative (“location, location, location”) don’t offer any value to the dialog, constructive ways to improve the location do. Since I sold my car in April I’ve made two shopping trips to Target on the #11 (Chippewa) MetroBus. 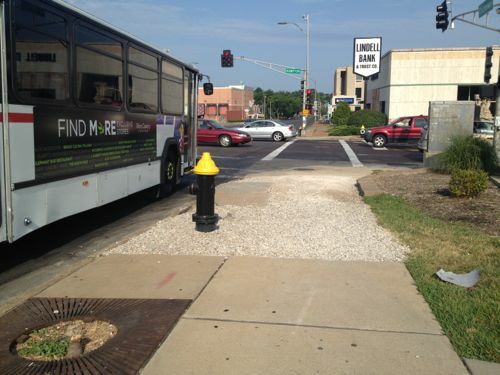 In June I spotted sidewalk construction between the bus stop and Hampton, the driver let me off on the west side of Hampton so I wouldn’t be stuck. In July it looked like the sidewalk was fixed, but it wasn’t. ABOVE: July 3 2012 the sidewalk remained not passable to my power chair. Freeze? Yes, the water main break happened on January 24, 2012! Did someone forget about the sidewalk? 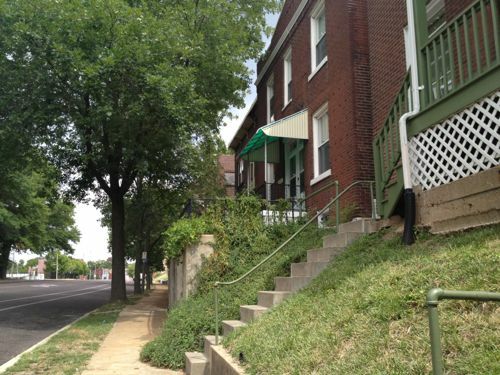 Many of St. Louis’ first historic district regulations were written in the early 1970s, the thinking at the time was we needed to strip away “clutter’ such as projecting signs in order to compete with the tidy new suburbs. Later regulations used the earlier ones as a base so today we have many regulations that are out of sync with our thinking 40 years later. Attitudes and thinking change. 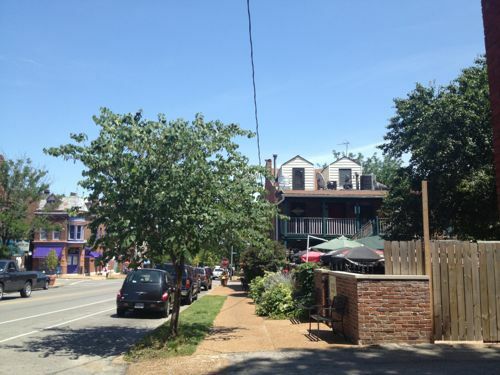 In 1947 the St. Louis Comprehensive Plan called for razing all of the Soulard neighborhood and building a new suburban-style subdivision, complete with cul-de-sac streets!! 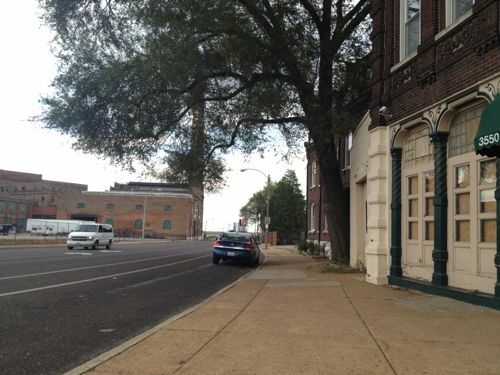 Plate Number 16 is a plan for the reconstruction of the Soulard Neighborhood. 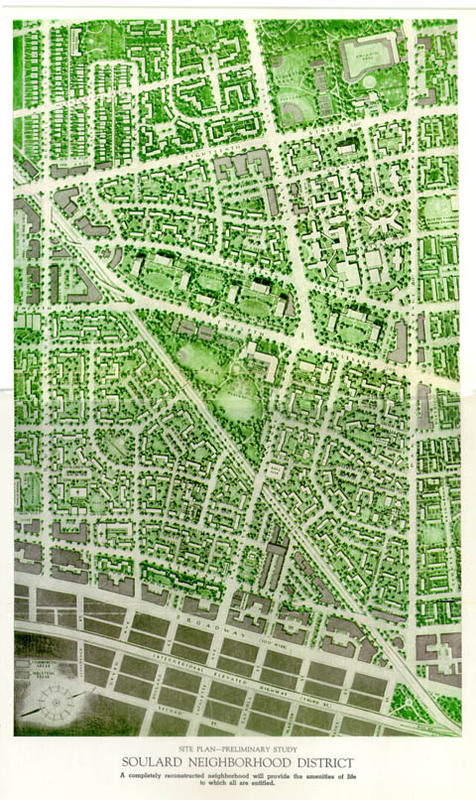 Some of the more important features of the plan are: the extension of Gravois Avenue from Twelfth Street to the proposed Third Street Interstate Highway, providing a direct route to the central business district; the widening of 18th Street, the widening and extension of 14th Street, the widening of Park and Lafayette Avenues; underground garages in the multi-storied apartment area between 12th and 14th; a neighborhood part of 10 acres or more complete with spray pool, community facilities and game courts; the extension of Lafayette Park to serve this as well as other neighborhoods; landscaped areas throughout the community for passive recreation; enlargement of the City Hospital area; grouping of commercial areas into orderly shopping centers and the complete reconstruction of the neighborhood into super residential blocks with a new street pattern to serve these blocks and to discourage through traffic. 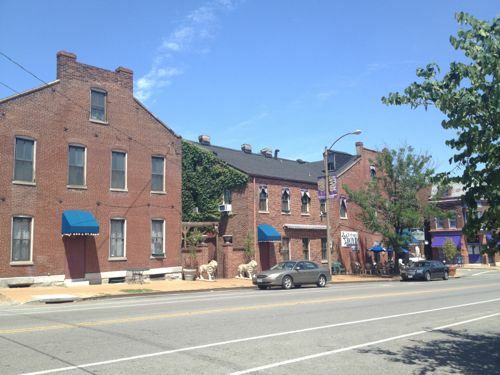 Just 25 years later Soulard is designated a historic district! Again, those early days of preservation regulations attempted to freeze the natural evolution of buildings, no doubt a reaction to a few decades of pro-demolition thinking. 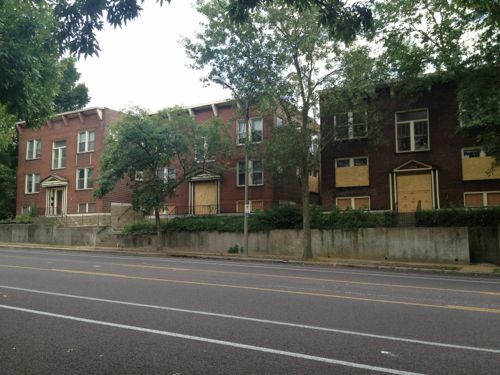 It’s possible, I believe, to preserve the historic neighborhood while allowing solar panels but not white vinyl windows with too many dividers between the panes. Yes, it’s subjective. In 25 years solar panels can be removed…of course so could inappropriate windows. 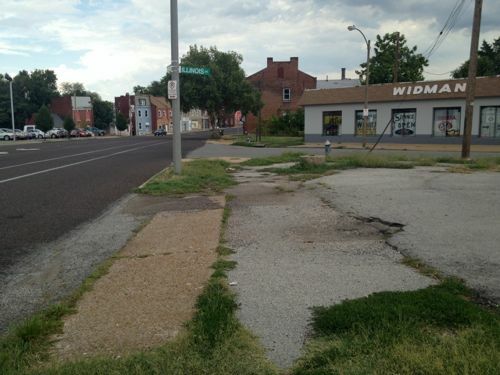 dumb, other cities can add this to the evidence that STL is a dying city. Where are the options for letting them install solar panels??? Creative solutions that maintains the historic facade but allows modernization. It’s not rediculous, but well designed/installed panels should be allowed. is there a compromise such solar panels in the shape of tiles? Understand the rules before you buy/rent/lease a buildling! Just like ordinances, these historic district standards need to be reviewed and updated on s regular basis. 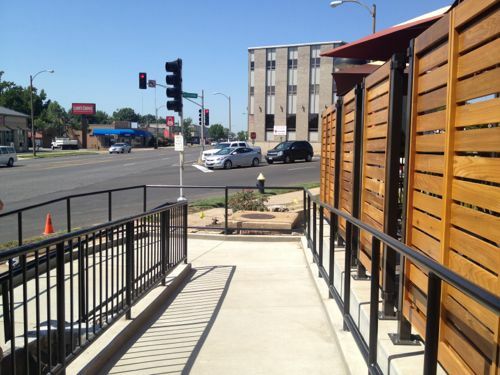 Monday the Preservation Board granted a variance to allow solar panels at Bastille.